Bevintel provides beverage inventory control and profit management for the hospitality industry using a customized service for beer, wine, draft and liquor. After years of using a cumbersome, somewhat inefficient barcode scanner and PDA device system, the company in 2012 was ready to upgrade its mobile devices to better match the pace of business and meet the evolving needs of its franchisees. The Bevintel team conducted significant research and tested multiple scanners for performance, speed of scanning, battery life and durability. Ultimately, it selected the Linea Pro 4 from Infinite Peripherals, Inc. (IPC), based on its excellent quality and reputation. The Linea Pro 4 adds a barcode scanner and a magnetic stripe reader to the Apple® iPod touch® or iPhone®, and works with custom software to create a mobile system for point-of-sale, inventory management, asset tracking, ID verification and lead tracking, among other capabilities. This lightweight handheld system uses Bevintel’s BevMobile application, which was built in-house to run on iOS, to conduct inventory management for wine, beer, draft and liquor when franchisees perform on-site audits in bars and restaurants. The result has been quicker, more accurate bar stock taking; ideal inventory levels; and minimized loss due to waste and theft. “Our franchisees need high-performance equipment to consistently do their job right, and this device performs with fast scanning speed, good battery life and a rugged exterior for everyday use,” said Lee. Bevintel also acknowledged IPC’s immediate responsiveness as a valuable benefit that distinguishes the nimble company in a landscape of giant bureaucratic corporations. “IPC’s customer service is quite responsive and helpful, making our jobs easier,” added Lee. Beyond inventory, Bevintel is considering adding more capabilities to this robust mobile system, in order to make it “the do-it-all system for our franchisees’ day-to-day operations,” according to Lee. With the ability to run multiple, custom-built applications, the combined system of the iPod touch or iPhone with the Linea Pro’s barcode scanner and magnetic stripe reader offers numerous opportunities for Bevintel to continue streamlining operations and maximizing efficiency in the field. The Linea Pro is available with optional Bluetooth® and RFID readers, and will be equipped to deliver near-field communication (NFC) in future updates. Software development resources and tools are available for the product so customers can program scanner and reader functions into their own software application. 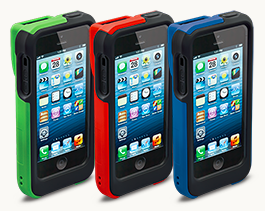 IPC also offers a variety of customizable accessories, including protective cases, holsters and stands. Bevintel is an independent profit control and revenue enhancement service for bars and restaurants with global headquarters in Louisville, KY. Since 1993, Infinite Peripherals, Inc. has been fueling mobility with cutting-edge mobile peripheral devices, receipt printers, mechanisms and receipt printer-related components. Anticipating trends and pre-empting solutions for a constantly evolving business landscape, IPC enhances operations in retail and other industries, including healthcare, hospitality, transportation, warehouse and logistics, entertainment and security.